If you ask The Baron, he says the only reason why one should have cake at all is because it serves as a vehicle for frosting. He's definitely a frosting type of guy and he especially enjoyed taste testing the frosting before using it on the cake! I will have to say that when it comes to this cake, I'm torn between what I like better - cake or frosting. The cake is perfectly spiced and the shredded carrots and raisins add just the right amount of sweetness. With the tender crumb and how easy it was to layer, I really liked how this cake turned out - even as gluten free. As for the frosting, it had this wonderful tang, thanks to the use of powdered buttermilk. That made all the difference and it was especially creamy, smooth and so easy to use on the cake. What's your favorite part of cake - the cake itself or the frosting?! Set a rack to the middle of your oven and preheat to 350-degrees. Grease an 18”x 13” rimmed baking sheet, line it with parchment paper, and then grease the parchment paper too. In a medium bowl, add together flour, baking powder, baking soda, cinnamon, nutmeg, salt, and cloves. Whisk together until combined. In another large bowl add sugar, oil, eggs, and vanilla. Use a whisk to combine until smooth. Gently stir in carrots and raisins with a rubber spatula until evenly distributed. Finally, add in flour mixture and fold in with your rubber spatula, but only until it is just combined. Mix using the paddle attachment on low-speed for 2 minutes; scrape down the bowl as necessary. Increase mixer speed to medium-low, then add cream cheese one piece at a time. Mix for 2 minutes until the frosting is smooth. Cut out a 6″x8″ rectangle out of stiff cardboard. Put the first of the cake piece on the cardboard. Use a spatula to spread 2/3-cup of frosting over layer. Repeat with two more layers. Place the final cake layer on top. Remove any crumbs from your spatula and frost the top with a 1-cup of frosting. Frost the sides of the cake with your remaining frosting. You just need enough frosting to hold the chopped pecans, not completely hide all the crumbs. 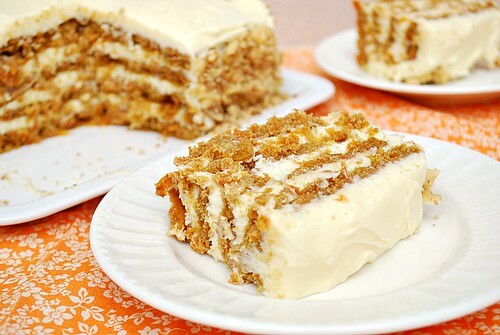 Holding the cake with one hand, use your other hand to gently press the chopped walnuts onto the side of your cake. Refrigerate for at least 1 hour before serving. That looks fantastic! Have you ever done a crepe cake? Dying to try it out. Wow - this sure looks good!